Facebook really wants to make sure everyone is on Facebook. 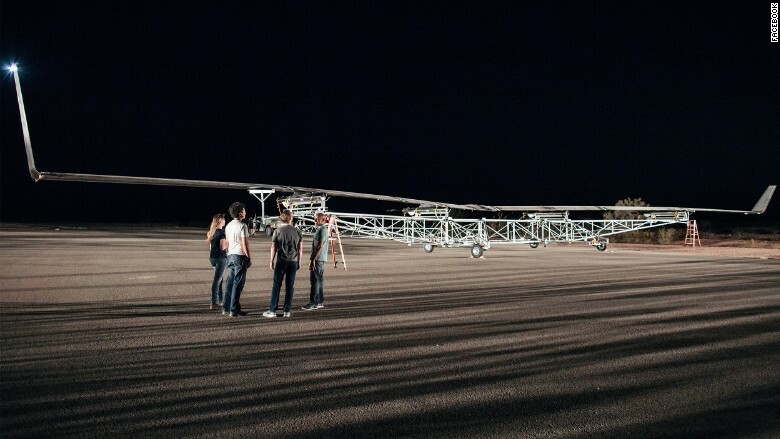 For 96-minutes last month, the company flew a 140-foot wide unmanned drone over Yuma, Arizona. 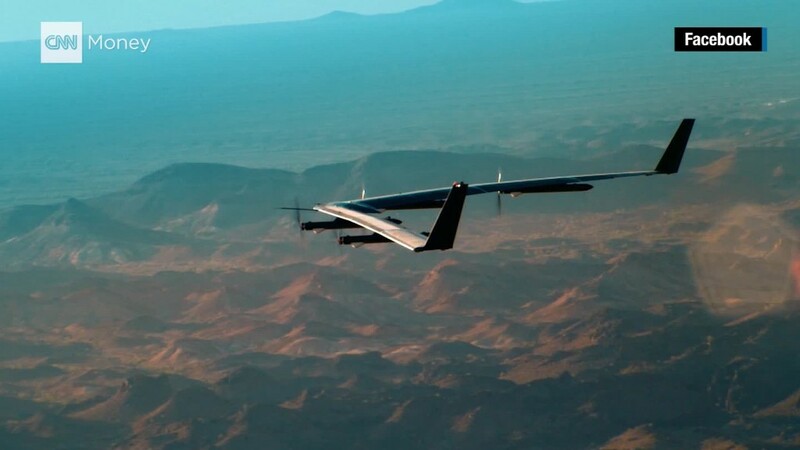 It was the first successful test flight of Facebook's full-scale Aquila drone. It is designing the boomerang-shaped aircraft to beam-connectivity down to billions of people who don't currently have access to the internet. 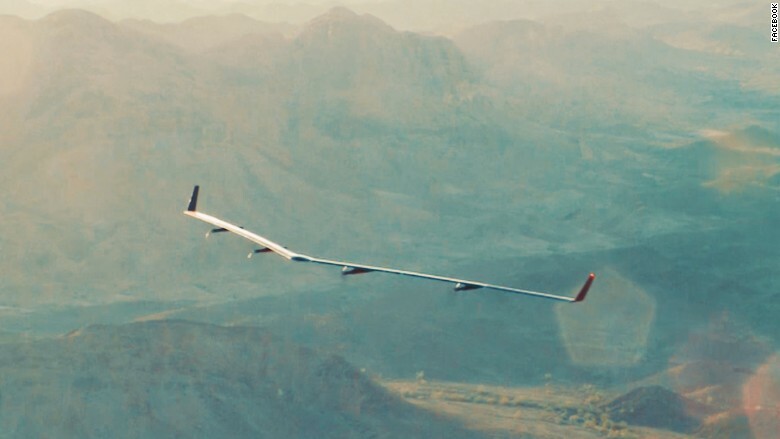 Eventually, Facebook (FB) hopes entire fleets of the carbon-fiber drones will fly for up to 90-days at a time in the stratosphere, between 60,000 and 90,000 feet. (The test flight only went up to 2,150 feet above sea level.) The drones will be solar powered and use lasers to deliver internet connections receivers on the ground, up to 30 miles in any direction. The connections will be fast, with speeds up to tens of thousands of gigabytes per second. Though the test was a success, Facebook says it still has lots of work to do. The aircraft is about as wide as a 747, but weighs less than 1,000 pounds (most of that is batteries). To stay aloft for months at a time, the team needs to make it lighter. The company has not said who will operate the final drone fleets. 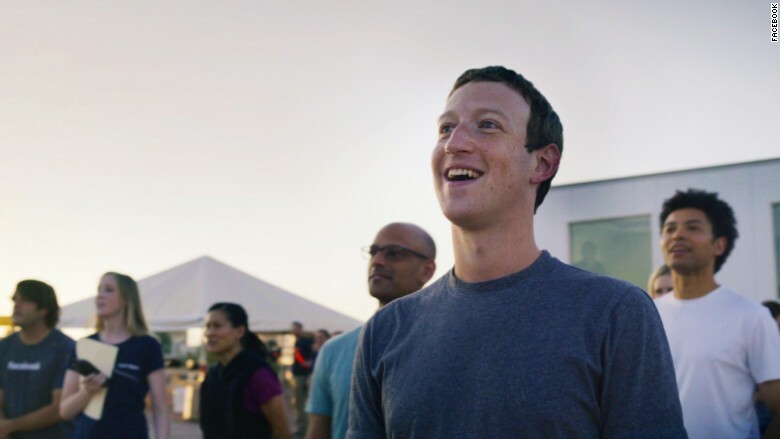 Previously, Facebook's Jay Parikh, the global head of engineering, said it was not interested in becoming a plane manufacturer or an internet service provider. It would leave the actual deployment to local internet providers and governments. Aquila has been one of the flashier projects out of Facebook's two-year-old Connectivity Lab. The group focuses on innovations that can help bring the internet to the parts of the planet that are still mostly offline. It is also working on other aircraft, satellites and ground communication systems to help increase access. The group is part of Facebook's Internet.org initiative, which has been criticized by Net Neutrality advocates for its Free Basics by Facebook program. The service offers free Internet access on mobile phones, but only to a limited number of websites, including Facebook. More than four billion people still lack access to the Internet, primarily in developing countries, according to the World Economic Forum. Lack of electricity and 3G coverage are major reasons and issues a drone might be able to address. But many people also lack the funds to buy devices that can connect to the internet, are illiterate, or speak a language not widely represented online. Facebook is not the only company racing to tap this market. Google is working on its own connectivity solutions, like its giant Project Loon balloons.